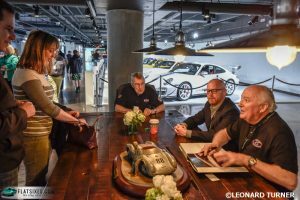 Flatsixes.com has a great post about Bob Ingram’s Porsche collection visiting the new Porsche Experience Center at One Porsche Drive (OPD) in Atlanta. That famous collection is based here in Durham, and I sometimes catch a glimpse of it when they load some of the Porsches on a transporter to take them to shows. And when you’re really lucky, you can sometimes see a super rare Porsche cruising down Main St. Check out this interview with Bob and Jeannie Ingram from 2013. This entry was posted on Wednesday, April 13th, 2016 at 7:35 pm	and is filed under word up. You can follow any responses to this entry through the RSS 2.0 feed. You can skip to the end and leave a response. Pinging is currently not allowed.